Lord Padmasambava is a historic Guru and is sometimes called the Second Buddha. He is considered to be the Founder of Tibetan Tantric Buddhism, was known to be a Great Master of Energy, is the Great Teacher of Teachers. 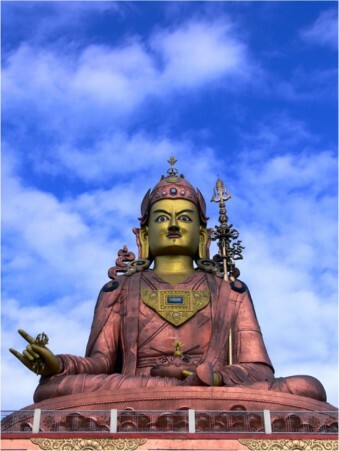 Lord Padmasambhava did Healing using various Methods and is a Highly Adept Spiritual Practitioner. 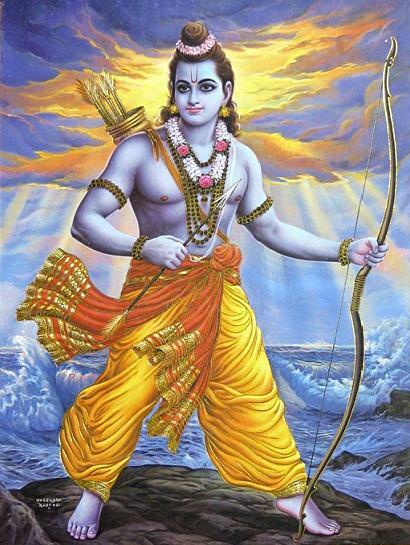 Lord Rama was reverently displayed. He was a Great Avatar." 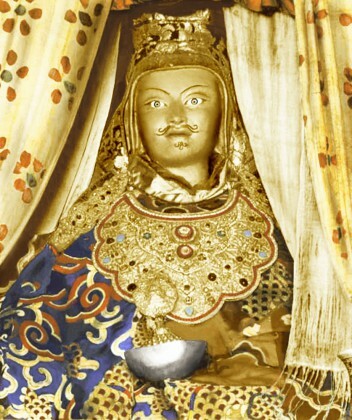 At The Inner Sciences Lord Padmasambhava is considered to be a Primary Source of our Spiritual Teachings. The Syllable by Syllable commentary explaining the benefits of the Vajra Guru Mantra were rediscovered by Karma Lingpa (14th Century). 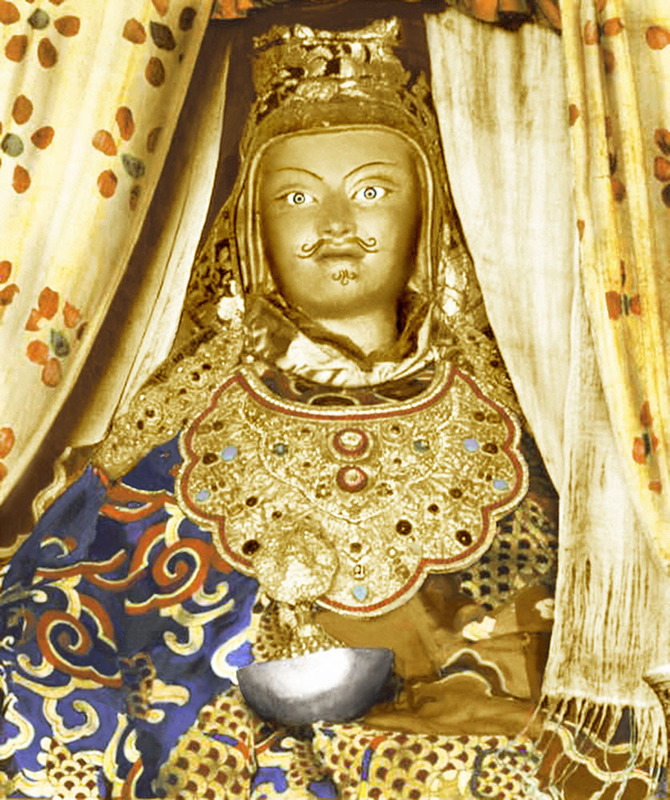 The Practice begins with an Invocation and then goes into a dialogue between Yeshe Tsogal (the Spiritual Consort Padmasambahva) and the Great Teacher Himself. "Even if you are not able to recite the Mantra for whatever reasons, you should mount it on the top of a victory banner, even when the Wind touches it, and that wind touches Sentient Beings, it will free them without a doubt. Alternately, you may inscribe it in clay or carve it in stone. This will also guard the path upon which these syllables are placed and guard that region from malevolent effects. You may also write this Mantra out in gold ink on dark blue paper and wear it as an amulet. The benefits of writing out, reading or reciting this Mantra defy any accurate measure and defy any standard measurement that could be applied. Having established this for the benefit of Beings in the future, I am hiding this Treasure. May it meet with a fortunate child of mine in the future who has Good Karma. The following Mantra was given by Lord Padmasambhava for Healing and Protection during this particular period of time. It is highly recommended that you use the Mantra regularly. Lord Padmasambhava on Healing - as told by His spiritual consort Yeshe Tsogal: “The Court Physician MERUTSEY, other Tibetan healers then asked ‘Master, as you intend to leave for India & will not remain here any longer, how should the Tibetan Healers of future generations behave? Noble court physicians, doctors, & healers, at first, in the presence of a Master skilled in Healing … Carefully study the basic treatises for applying & preparing medicines. to give treatment after diagnosing the disease is like pacifying fire with the remedy of water. Learned healers should treat others with Kindness & Compassion. Curtail your craving for wealth, since someone healed quickly may fall sick again. Do not give treatment according to the quality of the food & drink you receive, since someone cured now may again fall ill. Adjust the fee of medication to the type of person. but wrong livelihood will weigh heavily later. Free from craving in your heart … Give immediate treatment. Sick people are objects of Compassion … so alleviate their pain. your next life will be a rebirth as the eminent king of the Gods. While in this life you will enjoy good health & happiness. All sick people should respectful & please the life-saving master physician with food, drink & enjoyments. Adjust the fee for Treatment & the reward to the degree of importance. He will be despised in this life & go to the hells in the next (life) … Where he will be reborn is in the hell of repeated death & revival.